We have signed the Compact for Safe Cosmetics! InfantBows for Jennifer Lopez twins! InfantBows has entered the 2008 Home based Business competition in the most inovative category. Only a few more days left to vote. so please visit and vote by Sept. 30th. Thank you for all of your support. Just click the picture below or the title above. Thanks! We’re so glad to be able to show our support for women’s health, consumer health and environmental health by signing the Compact for the Global Production of Safe Health and Beauty Products (Compact for Safe Cosmetics). InfantBows has joined over 900 companies in making this commitment. We have officially been listed on the ever-growing list of companies that have signed the Compact for Safe Cosmetics, thereby pledging to inventory their product ingredients for chemicals linked to negative health consequences and replace them with safe alternatives! You can view the complete list here: www.safecosmetics.org/companies/signers.cfm. United States of America (Press Release) April 16, 2008 -- COLORADO SPRINGS, CO- Demand for USA made products continues to grow. KiddieWampus.com acknowledged this request by opening their online baby boutique with products and solutions entirely made in America. In developing a wide array of solutions and products, KiddieWampus.com became partners with InfantBows, a fellow supporter of made in the USA products. The partnership began at the request of KiddieWampus.com owner, and mother of two, Julie Raphael. Kiddiewampus.com carries simple solutions for busy parents. Founded by a working mother of two, it supplies families with modern products for child rearing. All products are chosen based on their ease of use, quality, affordability, and most importantly, all goods are made in the U.S.A.
InfantBows, LLC was created in 2001 by Jennifer Farquharson. Jennifer is a mother of 4 children and a daughter of a retired newborn nursery nurse. Jennifer founded InfantBows with the goal to generate a safe way to adorn little baby girls with bows, while providing work-at-home opportunities for mothers. InfantBows are all made completely in the USA by Work at home Mothers. InfantBows has joined Baby Swags to share in the excitement as Hollywood welcome's Jennifer Lopez and Marc Anthony's newest additions, boy/girl twins, Max and Emme. 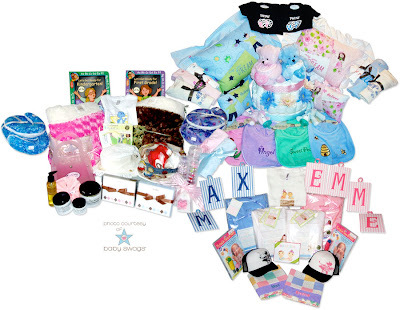 Baby Swags, a marketing firm specializing in pregnancy and juvenile products, proudly sent this special, one of a kind gift basket to the proud new parents, Jennifer Lopez and Marc Anthony. Full Press Release here. InfantBows sent a gift set with 40 Infantbows, InfantBow Glue, and matching Minky burp clothes in pink and blue. You can enter to win a matching gift basket here. If you are too late for this one, keep you eyes out for more to come! Two of Hollywood's Newest Shining Stars Have Been Sent the Biggest Baby Swags Basket Filled With Must Have's for 2008. Baby Swags shares in the excitement as Hollywood welcome's Jennifer Lopez and Marc Anthony's newest additions, boy/girl twins, Max and Emme. Plainfield, Il ( PRWeb) March 27, 2008 – Hollywood has two new shining stars named Max and Emme. Jennifer Lopez had given birth to a set of boy/girl twins and when the births were announced, Baby Swags sprung into action with twenty of their best mom-based companies to produce what is their largest gift basket to date. Baby Swags, a marketing firm specializing in pregnancy and juvenile products, proudly sent this special, one of a kind gift basket to the proud new parents, Jennifer Lopez and Marc Anthony. "I have loved Jennifer Lopez from day one and I was so excited to learn of her pregnancy." Stated Phyllis Pometta, Mom of three, and Baby Swags founder, "To be able to provide her with these truly unique, trendy and more importantly, functional new baby products that were all hand-crafted, hand-painted, or inspired by a mom, was a dream of a lifetime." Each of the twenty companies provided their best products to the new parents because as Claudine Niski states, "As a mother of triplets, I know moms need effective products that ease the workload when caring for more than one baby. I hope that Jennifer Lopez and her husband, Marc Anthony will find value in their new SnugEase Bibs as they care for their precious twins." Very Necessary - The SnugEase bib protects at the neck where other bibs gap. With it's memory arms and extra gathered fabric, provides more coverage, is more effective and is easier to use than other bibs. The SnugEase bib is the only bib that self-adjusts to any size baby, and that toddlers can learn to put on themselves. Dandelion Art provided beautiful canvas wall letters that were hand-painted and sealed on 5"x7" canvas panels. Letters hang from grosgrain ribbon loops attached to the back of each panel for easy hanging. Jennifer received all the letters needed to spell out the names of her new twins. Rocco Originals , "Twinkle Toes and Nails" is a musical nail clipper with flashing lights designed to turn nail clipping into a relaxing playtime. Judith Ann Cottage Designs, provided little Emme with two adorable hand-made vintage little girl hats all inside a decorative box. Sew Cute By Me, sent in two matching tooth fairy pillows and decorative pillow shams with removable pillow inserts sets for twins (one boy and one girl). Sew Cute By Me specializes in original, heirloom quality. Cedar Valley Publishing, sent in their set, "Let's Get Ready for Kindergarten" and "Let's Get Ready for First Grade" which has been provided to prepare Jennifer for their future schooling. Il Cocco di Mamma wanted Max and Emme to have their special and unique gifts for the pair of cultured cuties. Twins can now be spotted wearing a Que Pasa lap tee, Cielo organic onesie, or a bello/bella onesie. Baby Batik gave the each of the twins a burp cloth, bib and infant neck support set. Products are made from 100% cotton batiks and 100% cotton chenilles. Their colorful hand batiked fabrics create wearable works of art for the little munchkins. Infant Bows are special hair bows that stick on little tender heads and are great for babies with or without hair. They are made in the USA by work at home mothers, including the packaging and assembly. Also provided a pink and blue burp cloth set. Pillowcasegram, no gift is a gift without the custom made colorful teddy bear fabric pillowcases embroidered with the twins names on them. A pillowcase from Pillowcasegram will make any event extra special. Professor Pocket is a family owned company created to help children develop a lifelong passion for language learning. They produce entertaining and engaging bilingual CD's that children and adults can enjoy together, whether new to the Spanish language or completely fluent. A Touch of Whimsy Designs gave each twin a personalized stationary set that included flat note cards in their new argyle design. Pink and brown for Emme, and blue and brown for Max puts a contemporary twist on a classic design. Mio Piccolo has handmade baby blankets made with silk brocades and minky fabric all lined with a lamb like trim. "Where culture meets the cradle". Little Fit provided the twins with funky new baseball hats fitted just for toddlers lil heads. Pink for Emme and black for Max. Candles and Favors sent Jennifer a two tier twin boy/girl diaper cake that included 80 Pamper Swaddler size 1-2 diapers, 2 teddy bears, It's a girl/boy Receiving blankets. Cake was decorated with flowers and wrapped with coordinating ribbon. Gemini Greetings offers specialty cards for families with twins, triplets and more with their custom made specialty Thank You note cards and logo tee customized for boy/girl twins. Loving Baby, Inc holds the original US Patented swaddle blanket that is made using hi-quality 100% cotton. Unique and easy for the "perfect swaddle", this product has been pediatrician endorsed. Punk Rock Lullaby shows off their black "Twins Dice" onesie has a blue dice for Max and pink dice for Emme. They range in size from 3-6 months to 18-24 months and are versatile for any twin combo. A special pampering purse full of goodies from Parisian's Pure Indulgence which believes in using the finest regenerative properties, including organic oils, anti-oxidants and pure botanicals in each product has been given to new mom, Jennifer. Baby Swags Founder, Phyllis Pometta is very proud to provide this basket to Jennifer and Marc because they are loved by so many and the gifts that are being sent are all made out of a mothers love for a child. “The only gift greater than a mother’s love, is a child’s love.” States Pometta. Baby Swags is also working with Six Flags on a special Mother's Day project, in addition they will be providing baskets to be used as silent auction gifts for charities such as the Ronald McDonald House this October. "We are even producing our own Go Green Baby! Swags gift basket to bring awareness to Earth Day, as well as our 2nd Annual Celebrity Mother's Day gifting." Pometta adds, "It is going to be a truly amazing year filled with a lot of new projects that will benefit many." If you would like to purchase any of the products listed, or if you have a pregnant or juvenile product and you would like to participate in our upcoming gift baskets, or get additional information regarding our other related marketing services, please visit http://www.babyswags.com for more details. Baby Swags is quickly becoming a respected company that receives hits from France, Italy, Sweden, Australia, United Kingdom, Canada and throughout the United States. Jennifer Farquahrson, owner of InfantBows, is available for radio, television, magazine, newspaper, and website interviews. Read press releases about InfantBows. Thank you to the following companies that supplied these for us.